While raking alpaca beans in the stalls this morning, my farmer-mind started daydreaming. Wouldn't it be incredible to have Joel Salatin come to the farm, walk around and help us tweak, adjust, fine-tune, or even overhaul our operation to make the best use of the land, considering our primary purpose? That purpose is, of course, to connect people to the fiber and to connect people to each other. Joel Salatin has become a world-renowned expert on sustainable agriculture, speaking and writing about his ongoing experience at his farm, Polyface Farm, in Virginia. Four generations of Salatins now live and work at Polyface, entertaining visitors with total transparency, producing tons and tons of organic meat and produce. Joel has a witty and engaging style, backed up by decades of first-hand experience in radical, counter-cultural agricultural practices. 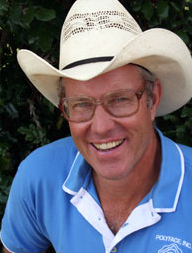 I want to win a Dream Farm Makeover with Mr. Salatin. So as I walked around Jacob's Reward today, I tried to see it through Joel's eyes - what would he recommend to us if he were touring the place with me? I think he would like how we welcome visitors and friends, and encourage other smallholders around us. He'd probably approve of our teaching kids and grownups where eggs come from, how fiber becomes fabric, and how to be strong contributors to their communities. I'd love his advice on better solutions for animal bedding, hay and feed storage, pasture care, species integration and space utilization. Think he could come up with some awesome ideas for us in a three or four hour visit? I'm trying not to ask for too much. Sometimes I think we have so far to go that it would take a full legal pad of To-Do Items to accomplish all the things Joel might see that could use reworking. But not our mission. I think he would approve of our mission. So, if you know Joel, or have some pull, I'd consider it the fantasy of a lifetime to learn from a man who embodies so much of what I'd like to be as a farmer. Awww, I wish I knew him and could send him your way! Just keep on doin! And maybe he'd give you a bridge to the East pasture across the creek. Can you tell I'm itching for you to get those sheep across the creek to all that deep grass?